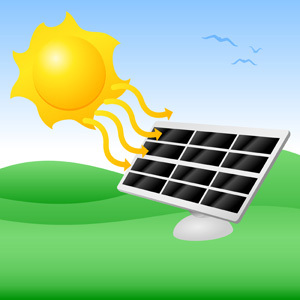 Solar Energy — Vector illustration of a bright orange sun beaming down light rays onto a solar panel in a grassy field. Go green! .:. My-Free-Vector-Art.com .:. Vector illustration of a bright orange sun beaming down light rays onto a solar panel in a grassy field. Go green!